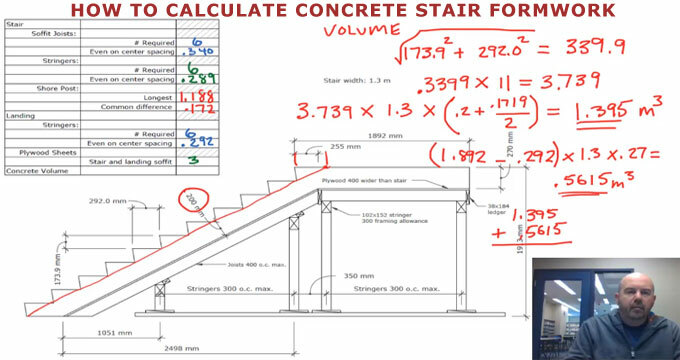 This video is based on making calculation for a simple concrete stair. One can learn how to work out the volume of concrete necessary for the stair itself & landing as well as compute formwork. Formwork belongs to a temporary construction. It’s objective is to retain concrete in proper position whilst it sets. As concrete is very heavy, formwork should have been firmly erected as well as braced and supported. To simplify the process for removing the formwork as soon as the concrete is dry the sheathing should be oiled properly prior to pouring the concrete. The materials like boards are utilized for sheathing which contain a thickness of 25 mm. In order to obtain a smooth surface or a high wall, currently 19 mm plywood is frequently used. Drenched the timber of the sheathing prior to pouring concrete to swell the timber and fasten the joints and thus resist run away of water from the mix. It will also resist too rapid drying of the exterior part of the concrete by absorption of water through the boards. To get the detail calculation process, watch the following video tutorial.